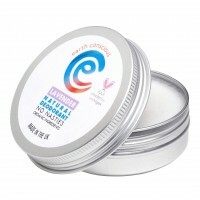 The newest member of the Earth Conscious family, this natural deodorant stick is applied directly from a cardboard applicator. Made with 100% natural ingredients using a coconut oil and shea butter formula that easily melts into the skin and smells amazing! In cold winter temperatures please allow a few seconds for the product to melt against your underarm. Fit Pit Woman is lightly perfumed with Rosemary and Bergamot essential oils. A wonderfully subtly sc..